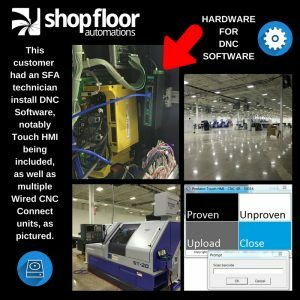 If you have recently made the decision to add DNC software to your shop floor to help with productivity and CNC communications, you are off to a great start. Option 1: Wired CNC Connect. This device supports 100’s of CNC’s per each Server PC that has a seat of DNC software on it. Simply run Ethernet cable to each machine and place the device on the control for drip-feeding. The IP address converts into a comm port with drivers. By using the network backbone, you are sending the serial signal five feet wth the supplied cable, giving you the most reliable and strongest serial signal. Available in 1 to 16 ports. Option 2: Wireless CNC Connect. The best option for those who like to move machines around and change the layout of their shop floor often. No cabling required. The device comes with an assigned IP – just to add your network, properly mount the device and it’s ready. Option 3: Multi Connect. While this device is not available for purchase yet, it is anticipated to be a ground-breaking piece of hardware for manufacturing shop floors. The unit connects to machines via MTConnect, PLC, Wireless, Ethernet, and RS232 Serial. This solution can also be used with DNC Software and Machine Monitoring products, which makes it very versatile. What are the best DNC software options available? Check out Predator DNC, Predator Touch HMI, Predator EditLock, and ExtremeDNC by visiting our DNC software landing page! Not sure what DNC Software is or why it would benefit you? Check out why some customers use DNC. You may also call (877) 611-5825 for more information about any products in this post.